The skin - the largest organ of the human body, which carries out essential functions. Healthy skin depends not only on a person's appearance, but also on his internal state. In addition, the skin - is a health indicator organism. Some skin diseases threaten only a cosmetic defect, and some are life threatening. Psoriasis, shingles, eczema, dermatitis, atopic dermatitis, boils. These skin diseases are the most common. Their principles are similar treatment as the cause of skin disease is a metabolic disorder triggered by stress, predisposition to allergic reactions, poor personal hygiene or any other imbalance in the body (hormonal disorders, deficiency of vitamins and trace elements, etc.). All skin conditions generally accompanied by itching. Psoriasis (psoriasis) - a chronic skin disease characterized by scaly appearance of white patches. Psoriasis is not contagious. Its causes not completely clarified, but we have found that an important role is played by heredity, and the immune and endocrine systems. Ringworm multicolored (pityriasis) - caused by pathogenic fungi. Development disease contributes to excessive sweating. The disease is rarely transmitted by contact. Ringworm pink - a disease suspected bacterial or viral, although it also does not exclude an allergic nature. Herpes zoster - is caused by the herpes virus. The virus affects the nerves, along the spine, ribs and facial nerve. Eczema - Noninfective chronic relapsing disease of the skin. Develops the combined effects of various factors on the body: hereditary predisposition to allergy, the immune system. Eczema can be triggered by stress, and even change the weather. Most often celebrated in autumn winter. An allergic (atopic) dermatitis - allergic nature of the disease, when which appear on the skin rashes. The children of the first years of life cause dermatitis food allergens. And later in life – house dust, pollen, stings insects and pharmaceuticals. Boils - an acute purulent inflammation of the hair follicle of the skin and related sebaceous gland surrounding tissues. Pathogen - Staphylococcus aureus that enters the body through the skin damage (scratches, insect bites, wounds, scratches, injections) with a decrease in the body's defenses. Most dangerous boils on the face (nose, forehead) since this pathogenic microbes bloodstream may enter the head- the brain, leading to severe consequences (meningitis, septicemia). Provoke the appearance of the disease stress, prolonged use of drugs, failure to comply with regulations personal hygiene. 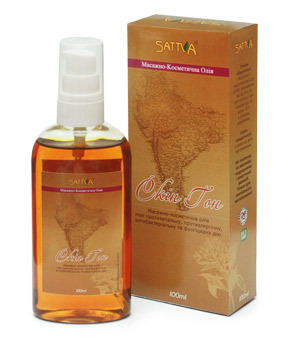 Sattva Skin Tone oil has anti-inflammatory, antipyretic, anti-allergic, anti-bacterial and fungicidal action. It should be applied twice a day on the affected area and gently vterat. Thus it will penetrate deeper into the skin, and provide prompt action. Karanj Seed Oil - (Pongamia Glabra) - is a healer of wounds, antibacterial, anti-inflammatory and analgesic. Neem Oil - (Azadirachta indica) - a known antiseptic and antibacterial agent for various skin diseases. He is also the agent of blood purification. Bakuchi Seed Oil - psoralen leschinolistnaya (Psoralea corylifolia) - useful in leprosy, ulcers. Oil Henna - Lawson Alba (Lawsonia alba) - is used to improve skin and skin burning. Turmeric Oil (Curcuma longa) - belongs to the ginger family. The rhizomes are used for medicinal purposes. Turmeric is an antibacterial, healing agent, it has a strong antitoxic effect. Shown with arthritis, sore throat, skin diseases, diabetes, anemia, wounds. Mustard oil (Brassica juncea) - useful in skin diseases, and also acts as a painkiller. Seena seeds oil (Cassia tora) - seeds and leaves are used in the treatment of skin diseases and leprosy. Tubrak Oil (Hydnocarpus laurifolia) - useful in skin diseases and leprosy. Obtained by cold pressing of the seeds of the plant. Herbs present in Sattva Skin Tone oil has antipyretic, anti-inflammatory, antibacterial, antiseptic, fungicidal. This massage oil penetrate deep into the skin to ensure rapid action. It is very effective for healing open wounds, including burns. Caution: Sattva Skin Tone oil is for external use only! How to use: Using Skin Tone oil is a very simple process. To begin with, wash your hands and clean and dry the affected area. Now, take a small amount of the herbal oil onto the fingertips and apply it on the pain affected area. Massage by working in a circular motion till the oil is absorbed completely. A small amount of Sattva Skin Tone oil applied to the affected areas, including open wounds and massage gently 2-3 times a day or as directed by the physician. Eczema, rash, demodex, boils, itching and burning, paronychia, prickly heat, skin diseases, dermatitis, impetigo, burns, etc. Oil 100 ml + 2% in food grade PET bottle.